DNMT Inhibitors | Metheor Therapeutics Corp.
MTC has developed a unique and proprietary approach to identify, validate and optimize methyltransferase inhibitor leads. The initial clinical indications MTC is targeting present unique DNA methylation patterns identified by specific sets of genes aberrantly methylated in the disease. The key to the process is to focus on designing /discovering compounds that affect methylation in these gene-sets in tumor cells. MTC inhibitors are also being developed to be selective for targeted members and isoforms of the methyltransferase enzyme family enabling us to target the specific enzyme that is causing the aberrant gene activity in a particular disease. 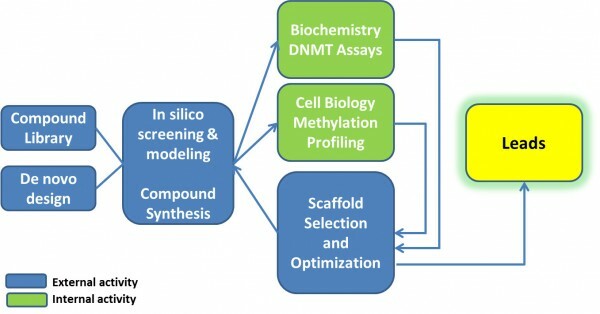 The platform consists of a powerful computational compound discovery model combined with state of the art medicinal chemistry and biological validation system employing DNA methylation assays. After demonstrating inhibitor activity, compounds undergo optimization by iterative process (modeling-chemistry-biology) guided by the final biological targets represented in the cell-line based assay system. Emerging leads are assessed for pharmacological properties and tested for the activity in in vivo models.